"For a wide-ranging take on true crime illustrated with infographics, The Crime Book is a bloody, engrossing history of criminology, from bandits and serial killers to 21st century cyber predators. Famous cases include Jack The Ripper, the Black Dahlia murder and Bonnie and Clyde." 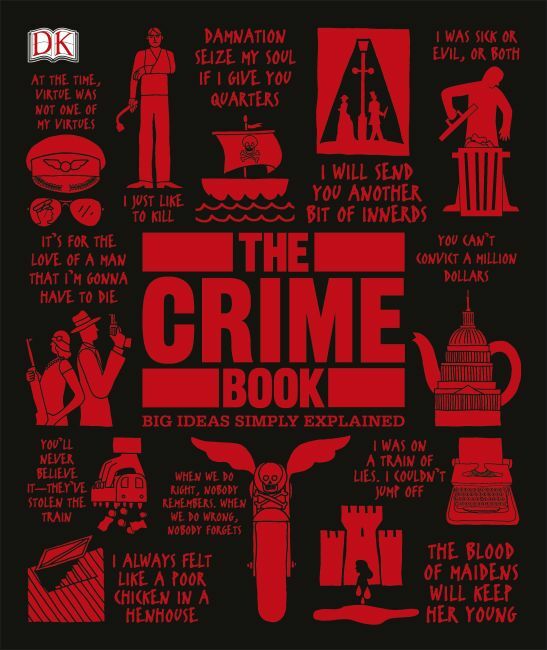 "Like other Dorling Kindersley books, the layout is what jumps out at you ... we think it will make a great gift for anyone who loves crime fiction. It seems a perfect reference tool for authors who need a little inspiration or who want to ground their work with a few facts from the world of true crime ... Crime fiction author Peter James adds the cherry on top with his foreword." "From the 1671 attempt to steal the Crown Jewels to the 2015 Hatton Garden heist, and taking in Burke and Hare, Bonnie and Clyde and the Bandit Queen of Uttar Pradesh, The Crime Book by Dorling Kindersley is an exhaustively researched and lavishly illustrated treasure-trove of malfeasance through the ages and around the world." Learn how media coverage changed through history, from the tragic assassination of President Abraham Lincoln to romanticizing Bonnie and Clyde's doomed fate to the kidnapping and murder of Charles Lindbergh's baby, which is considered the first international crime tabloid story. Foreword writer and consultant Cathy Scott is a Los Angeles Times best-selling author, and an established crime writer and investigative journalist for The New York Times and Reuters. Best known for writing The Killing of Tupac Shakur and The Murder of Biggie Smalls, she has written extensively about street gangs and organized crime, including mob daughter Susan Berman in Murder of a Mafia Daughter, and drug kingpin "Freeway" Rick Ross.